We've lived in this house for 17 years. It's where Stacy and I have spent all but the first year of our marriage. It's the only home that our three kids have ever known. It's not without its shortcomings, but by and large, it's been a good home. It's served all our basic needs, and the neighborhood has been pretty good. We've made lots of fun memories here. We've been blessed, and we lack for nothing. Our boys, especially, are more nostalgic than most, and are having a particularly tough time saying goodbye to their home. I'm the same way, really. I went through this when my parents moved away from our family farm two years ago, so I'm a little more accustomed to dealing with it. My prayer for our boys is that God will give them an excitement for our new home, and that they will discover great new possibilities that never could have happened here at this old place. I've been falling back to that verse a lot during the four years we've spent trying to build and buy various other houses. I trust that because this is the house that God finally allowed us to buy, that this is part of his great plan for us. My Mom brought this up when we were dealing with leaving the farm, and it holds true to this home of ours, too. Leaving would be a lot easier if we'd been miserable here, but as I said earlier, we've been very blessed. 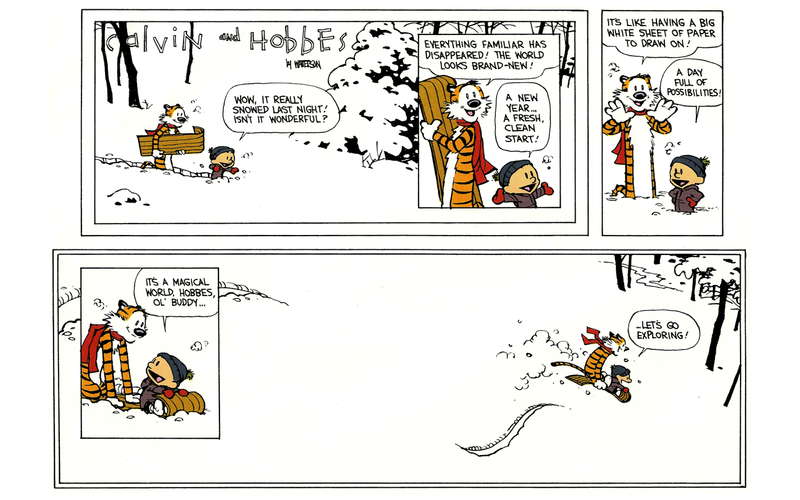 The third thing that's come to mind has been the final frame of the popular Calvin and Hobbes comic strip that aired on 31 Dec 1994. Many of us were sad to see the strip go, but the attitude expressed is full of hope for the future. This last chapter of our lives has been good, but there's more to this story. I'm hopeful that this next chapter will be a great adventure that our entire family will love even more than the first. It's like having a big, white sheet of paper to draw on! A day full of possibilities! Let's go exploring!